From Francis Alÿs and Ursula Biemann to Vivan Sundaram, Allora & Calzadilla, and the Center for Urban Pedagogy, some of the most compelling artists today are engaging with the politics of land use, including the growth of the global economy, climate change, sustainability, Occupy movements, and the privatization of public space. Their work pivots around a set of evolving questions: In what ways is land, formed over the course of geological time, also contemporary and formed by the conditions of the present? How might art contribute to the expansion of spatial and environmental justice? Editors Emily Eliza Scott and Kirsten Swenson bring together a range of international voices and artworks to illuminate this critical mass of practices. 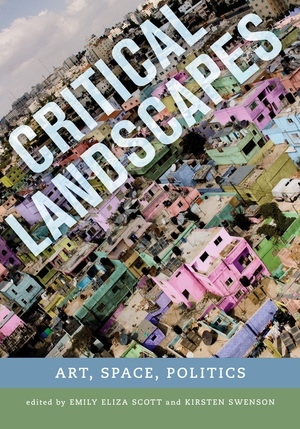 One of the first comprehensive treatments of land use in contemporary art, Critical Landscapes skillfully surveys the stakes and concerns of recent land-based practices, outlining the art historical contexts, methodological strategies, and geopolitical phenomena. This cross-disciplinary collection is destined to be an essential reference not only within the fields of art and art history, but also across those of cultural geography, architecture and urban planning, environmental history, and landscape studies. Emily Eliza Scott is a postdoctoral fellow at the Institute for the History and Theory of Architecture at the Swiss Federal Institute of Technology (ETH Zürich), and founding member of the art collectives the Los Angeles Urban Rangers and World of Matter. She also served as a National Park Service ranger from 1994 to 2005. She is a contributor to Ends of the Earth: Art of the Land to 1974 and Geohumanities: Art, History, and Text at the Edge of Place, and has published articles in American Art, Art Journal, Cultural Geographies, and Third Text. Kirsten Swenson is Assistant Professor of Art History at University of Massachusetts, Lowell. She is the author of Irrational Judgments: Eva Hesse, Sol LeWitt, and the 1960s and has written numerous articles for Art in America, Art Journal, and American Art.